Outlook: The Bulldogs have a solid handful of experienced players back this season and will be looking to mix in a good amount of youth during the 2017 season. While Canton will have plenty of seniors on the field, head coach Dave Bohane expects a good mix of juniors and even sophomores to get plenty of playing time. The youth starts under center as sophomore Johnny Hagan takes over as the team’s starting quarterback. He’ll have two big targets to work with in Tony Harris and Christian Walker as well as a versatile backfield that features Alec Ragusa and Gersom Rivera. On the defensive side of the ball, a group of experienced linebackers, including Ragusa, Jude Albert, Brendan Albert and Ben Seamen will anchor the Bulldogs. Kearvens Theodore will be a big piece on the defensive line, alongside Chris Benjamin and Jack Connolly. Sophomore Kyle Fitzgerald will take on the responsibility of being a starting safety but will have plenty of experience in the secondary with seniors Cordell Smith and Marquise Montes manning the corners. Key/Returning Players: Teddy Maher, Sr., SS/WR; Phil Dure, Sr., CB/WR; Louis Piccolo, Sr., FS; Devin Hassett, Sr., QB/SE/FS; Jake Addeche, Sr., WR/CB; Patrick Kaveny, Sr., DE; Mike Henri, Sr., RB/SS; Matt Pond, Sr., LB; Mike Luong, Jr., RB; Matt Suess, Sr., OL/DL; Anthony Capachietti, Sr., RB; Hunter Williams, Jr., OL; Andrew Longa, Jr., OL; Kade Treannie, Sr., OL. Outlook: Foxboro is looking to ride the strength of a deep senior class to get back to the playoffs after missing out a season ago and also get back into the Davenport division title hunt after winning it two years ago. The Warriors boast 35 seniors and have a handful of experienced juniors that are back after winning five games last season. Under center, senior Devin Hassett and junior Liam Foley are both in the running to take snaps. Hassett is also an option to catch the ball, giving the Warriors some flexibility on the offensive end. A strength that Foxboro will rely on on the offensive side of the ball is their playmaking ability at the skill positions. The Warriors boast multiple capable ball carriers (Mike Henri, Mike Luong, Anthony Capachietti) and pass catchers (Teddy Maher, Phil Dure, Jake Addeche) that can make things happen. Seniors Matt Suess and Kade Treannie and juniors Hunter Williams and Andrew Longa will see time on the offensive line. Defensively, Foxboro will be looking to improve after giving up just over 29 points per game against division opponents a year ago. The Warriors will be relying on quickness and an aggressive demeanor to make plays on the defense end. Louis Piccolo, Maher, Hassett, Addeche and Henri are all likely candidates to see time in the secondary while Pat Kaveny (defensive end) and Matt Pond (linebacker) will lead the front seven. “Chemistry amongst 35 seniors and a return to ‘old school Foxboro football’ will personify the 2017 season,” said Foxboro head coach Jack Martinelli. Key/Returning Players: Ryan O’Toole, Sr., RB; Matt Curran, Sr., QB; Patrick Brogioli, Sr., OL/DL; Tyler Joyce, Sr., TE/DE; Cullen Burns, Sr., OL/DL; Kayden Kelley, Sr., WR/CB; Will Pointer, Sr., RB/LB; Shapel Feaster, Jr., RB/CB; Matt Annantuonio, Sr., RB/CB; David Abbatinozzi, Sr., OL/DL; Brendan White, Jr., TE/S; Josh Ligor, Jr., OL/DL; Chris Rivera, Sr., RB/LB; Jacob Eosco, Sr., OL/DL. Outlook: First year head coach Anthony Vizakis is looking to the past as he begins his first season with the Scarlet Hawks. Vizakis is hoping the 2017 Hawks will pull from the tradition of the program as they look to get back to the playoffs once again this year. It will certainly be a challenge as Milford graduated some of the most talented players in the league, from all different parts of the field. One constant is that the Hawks return quarterback Matt Curran for his senior year. Another familiarity for Curran will be running back Ryan O’Toole, who saw a lot of time last year alongside Blake Hill in the backfield. Receiver Kayden Kelley and tight end Tyler Joyce are also back after getting plenty of reps on the offensive end as well. Seniors Patrick Brogioli and Cullen Burns are two returning starters from the Hawks’ offensive line. Defensively, the Scarlet Hawks will be looking to continue what they did in 2016, allowing just a shade over 17 points per game. While it was impressive that Milford allowed just 28 points total against Sharon, Canton and Foxboro, the Hawks will need to make a leap to try and halt the offensive firepower of North Attleboro and Stoughton. It will start up front with a tough line and then an athletic group of linebackers. Will Pointer and Chris Rivera will be two of those linebackers while Shapel Feaster and Matt Annantuonio will join Brendan White as members of the secondary. Key/Returning Players: Chad Peterson, Sr., QB/P; Zach DeMattio, Sr., RB/LB; Sam Bullock, Sr. OL/DL; Brad White, Sr. OL/DL; Mario Bresko, Sr., SE/DB; Ryan Clemente, Jr., OL/DL. Outlook: With two straight league titles under its belt, North Attleboro isn’t planning to slow down anytime soon. With record-breaking quarterback Chad Peterson back under center for his senior season, the Rocketeers look to be the early favorite for another Davenport title. After two straight impressive season, Peterson will look to lead this year’s Rocketeers to their second straight Davenport title and another deep run in the playoffs. While playmakers Bobby Mylod and Nick Rajotte are gone, Peterson will have running backs Zach DeMattio and Adam Eberle to work with and receivers Mario Bresko, Omar Jasseh and Ryan Gaumond when he drops back to throw. Junior Ryan Clemente already has a year’s experience under his belt and could be one of the most dominant lineman in the league this season. Sam Bullock, Brad White, John Bradley, Geoff Wilson, Jack Puccio, Aidan Harding and Joe Larkin will all be options alongside Clemente on the offensive line. One of the biggest reasons for North’s success a year ago was its very impressive defense, which allowed just under 12 points per game (Hockomock League best). Big Red will have to replace some big names and might have to overcome some inexperience early on, but head coach Don Johnson notes there is good competition among the front seven and secondary. Bresko is one player that has experience in the secondary while DeMattio (linebacker) and Bullock (defensive tackle) will anchor the front seven. Key/Returning Players: Austin Dodes, Sr., WR/DB; Drew Naisuler, Sr., TE/DE; Coleman Loftus, Jr., OL/DL; Chris Gong, Jr., WR/DB; Sam Spencer, Jr., TE/LB; Aaron Strong, Jr., RB/LB; Jeremy Ruskin, Jr., QB. Outlook: The 2017 version of the Sharon Eagles might be on the young side, but head coach Dave Morse is hoping that youth injects some energy into his squad. The Eagles started and finished the 2016 season strongly, going 3-0 to begin and then closing with a win over Hopkinton and then a Thanksgiving Day win over rival Oliver Ames to finish over .500. Now, the Eagles will be trying to repeat that success while improving their league record. Junior Jeremy Ruskin is back under center after taking over late in the season last fall and will have senior Austin Dodes and tight end Drew Naisuler available as pass catching options. Junior Aaron Strong saw some carries last year and will likely be a feature back this season. Defensively, the Eagles were one of the stingiest units in the entire league (just over 18 PPG). The Eagles held six of their 11 opponents under 14 points per game. Junior Coleman Loftus is a returning starter and a two-way lineman for the Eagles while junior linebacker Sam Spencer will look to make an impact this season. Chris Gong joins Dodes and Strong in the secondary while Naisuler will be a part of the Eagles’ front seven. Key/Returning Players: Evan Gibb, Jr., QB; Jason Joseph, Sr., DE/TE; Justin Ly, Sr., FB/LB; Colin Sanda, Sr., WR/DB; Ruben Gonzalez, Sr., WR/RB/DB; Alex Sjoquist, Sr., RB/DB; Paul Feeney, Sr., OL/DL; Anthony Burke, Sr., OL/DL. 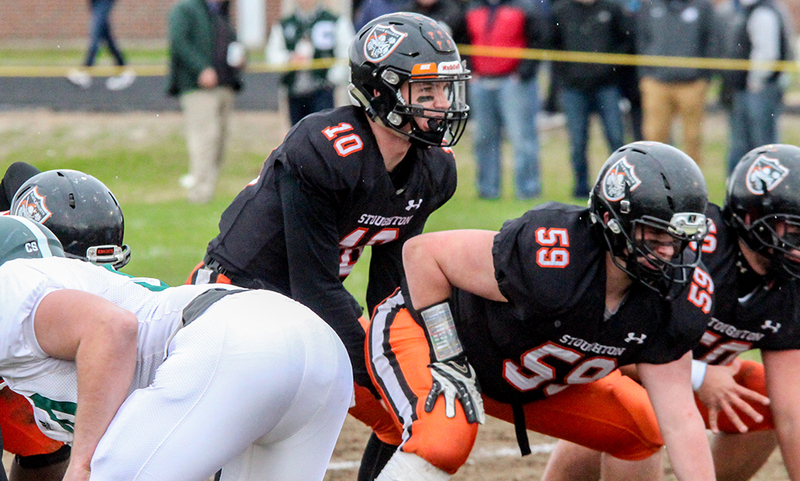 Outlook: The Black Knights have had a strong stretch of success over the past couple of seasons and will try to continue that in 2017, despite graduating a very memorable senior class last season. Gone are playmakers Ryan Sullivan and Izon Swain-Price, as well as linemen Lino Azul and Andrew Iverson and a handful of terrific role players. But, one key returning piece is junior quarterback Evan Gibb. Gibb took over early on during his sophomore season and looked very comfortable in his role. Now he will have to be a leader of the offensive unit. Justin Ly was the third member of Stoughton’s three-headed rushing attack a year ago and will likely be one of the team’s feature backs. Ly is a tough runner that can get yards up the middle but also has speed to get to the outside. Alex Sjoquist will likely also get carries while experienced receivers Colin Sanda and Ruben Gonzalez should see increased roles in 2017. The Knights are well known for their defense during the successful stretch. While there will be a lot of new faces in new places, the Knights are relying on improved speed to go along with their strength. Jason Joseph is back after a solid junior campaign to lead the defensive line along with Paul Feeney, while Ly is joined by Anthony Burke as linebackers. Sanda, Gonzalez and Sjoquist will all see time in the secondary for Stoughton.